Meet “Wave Star” of Denmark. 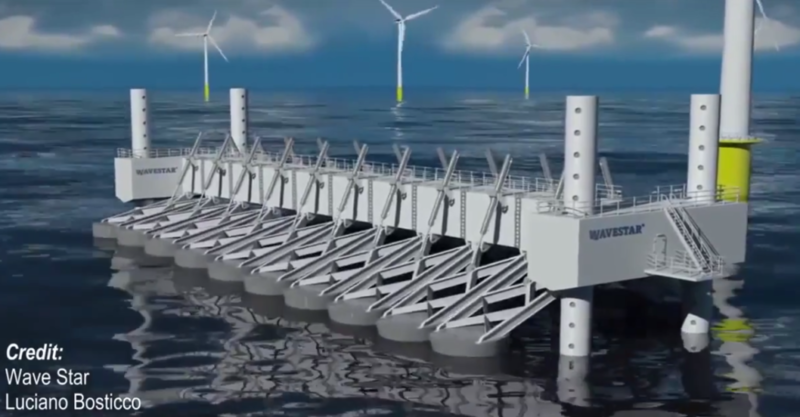 It is a facility designed to convert kinetic wave power into electricity. Wave Star is equipped with kinetic-energy harvesters called “floats.” The floats move up and down with the kinetic motion of the waves. The motion of the floats is transferred via hydraulics to rotate power generators. Their facility enables continuous energy production and a smooth output. The full scale device will be equipped 20 floats of 10 m (33 ft) in diameter. Each power station will be able to produce 6 megawatts of energy, a single machine providing enough energy for roughly 4000 homes. In the event of a storm, the floats can be lifted to a safe position. The facility could also be upgraded to utilize wind and solar power. The power stations are planned to hit the market this year!